Carla Rees - flutes player & artistic director of Rarescale. Carla Rees is a UK-based low flutes player. 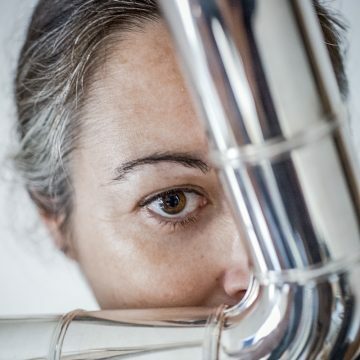 She is the artistic director of Rarescale, an ensemble which exists to promote chamber music repertoire for low flutes, and Director of low flutes publishing company, Tetractys. She has been working closely with Michael and Matthew along with other composers who are writing new works for the tour. The contrabass flute is a rare instrument, most usually found in flute choirs, but in this programme it takes on a new solo persona. It is both impressive in sound and size, and complimented by electronics this concert will be a sonic delight of rarely heard music. The National Lottery through Creative Scotland Open Project Funding has supported the Scottish concerts, and along with Help Musicians UK Career Development Bursary, the development of Matthew’s new piece.